Our sightings this past week have varied in regard to the number of whales we have seen during our trips, as they have been a bit more spread out than they had been the week prior. We have typically been seeing 3-8 whales depending on the day, and many have been different individuals than last week. 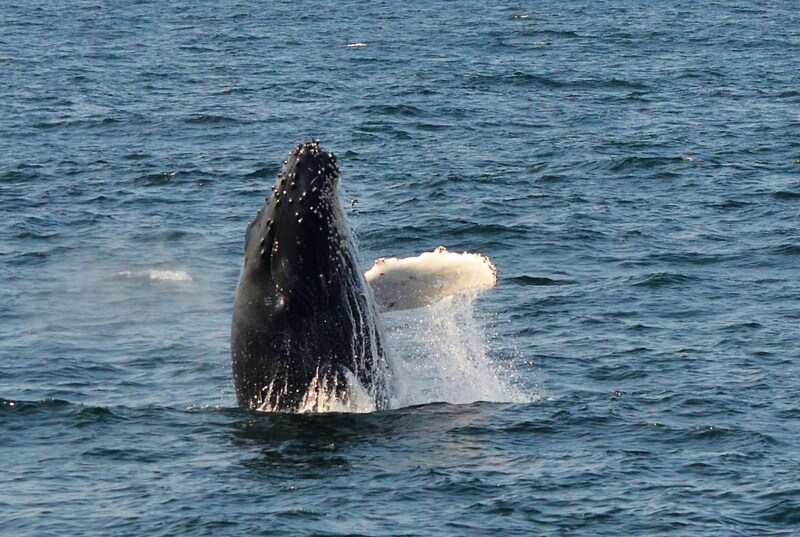 We have been watching a humpback whale, Northstar for most of our trips in the last few days. Northstar was recently reported with an injury on its back. Unfortunately, it seems as though this whale is another example of one threat that many marine animals encounter- ship strikes. 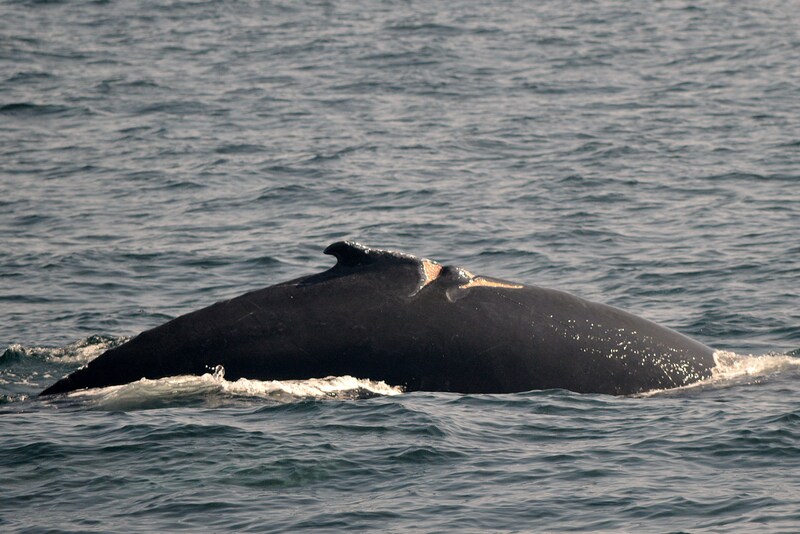 There are a number of whales in the Gulf of Maine who have scars from collisions with boats and propellers, but it sometimes is easy to lose sight of what that really means. When we see a whale who has injuries that were recently acquired, it really does illustrate the danger posed to these animals. We are hoping Northstar will make a full recovery and will update further if we see this whale throughout the season. An injury to Northstar’s back, possibly due to a collision with a boat. Northstar was swimming alongside Hippocampus. We watched these two whales during both our morning and afternoon trips, along with another group of whales who were nearby (Nile and calf with Perseid and calf). 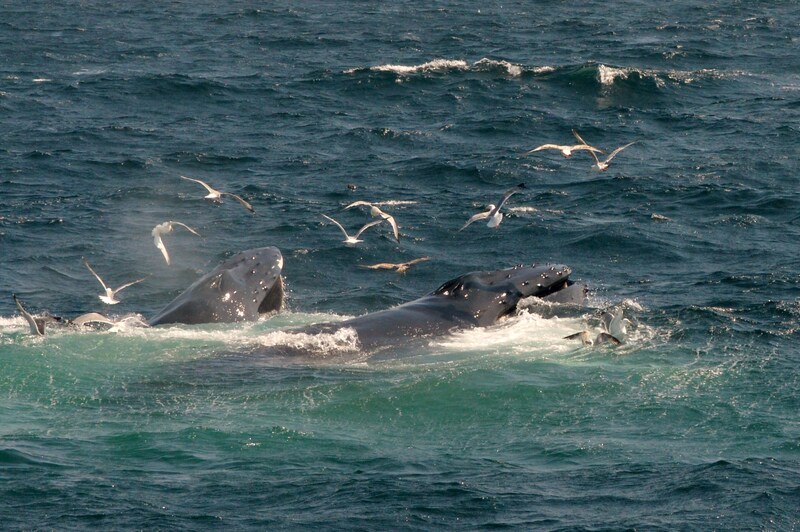 We returned to the same spot during the afternoon and began with the two mothers and the young whales. 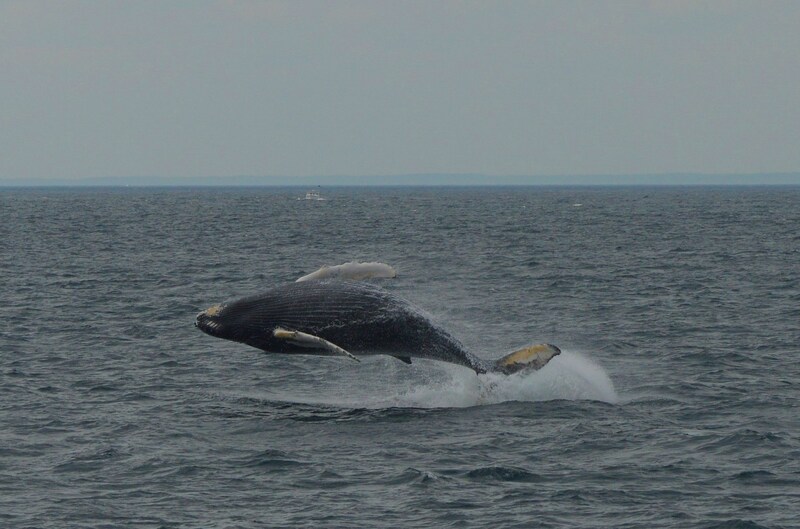 As we approached we noticed both calves being very surface active- a few breaches, rolling over, and tail breaching. Shortly after we arrived Nile’s calf provided an absolutely unbelievable breach just yards away. Interns Morgan, Andrea, and I were talking afterward about our ability to see clearly underneath this young whale. Such a fun trip to be on! It has been a long time since we have had this many whales on the northern corner of Stellwagen Bank. Of course we are hoping they will remain close by, but we have already noticed the whales moving around a bit more. Early in the week we were watching whaleseach day in almost the exact same location as the previous day, and by yesterday they had moved by a couple of miles. We watched as humpbacks Aerospace, Jabiru, Bayou, Pele, and Milkweed swam nearby, possibly looking for food while Milkweed’s calf gave us an exciting experience. S/he breached repeatedly before moving on to tail breaches and a series of rolls. It’s not clearly understood why whales breach or engage in these other types of surface activity, but one thought that sometimes calves are more playful, especially while Mom is looking for fish to eat (the calves are typically still nursing on the mother’s milk at this point in the season). Whatever the reason, we had an exciting trip with great looks at all of the whales who were out there. As we have seen throughout this season, things have changed very rapidly. More than once in 2014 the whales have stayed in a relatively small area for days at a time, only to travel far overnight. 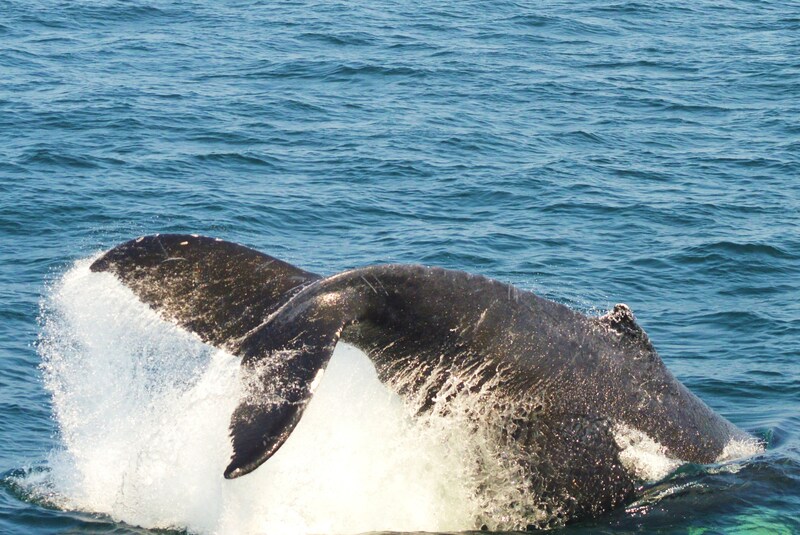 What is exciting about whale watching is that no two trips are alike, even from morning to afternoon. We certainly enjoy every day as they come. The calf did some surfacings and breaches with its mouth wide open- practicing using that baleen to feed later on? The sightings recently have been so amazing- sometimes I wonder how long they can possibly last, but we are enjoying every minute of our trips lately! 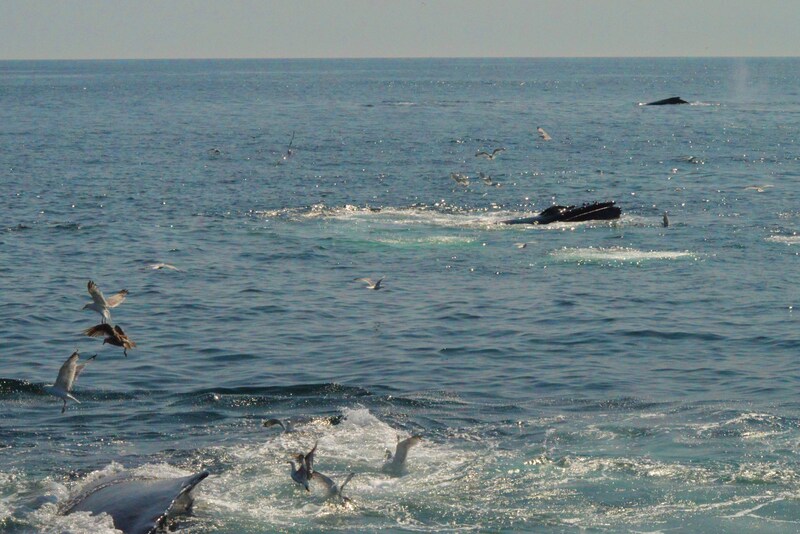 This morning in particular we had 25 or more humpback whales feeding as far as our eyes could see. Many of the whales were kick feeding, and it is so neat to see how each individual has a unique pattern of kicks before coming up to the surface, mouths wide open. 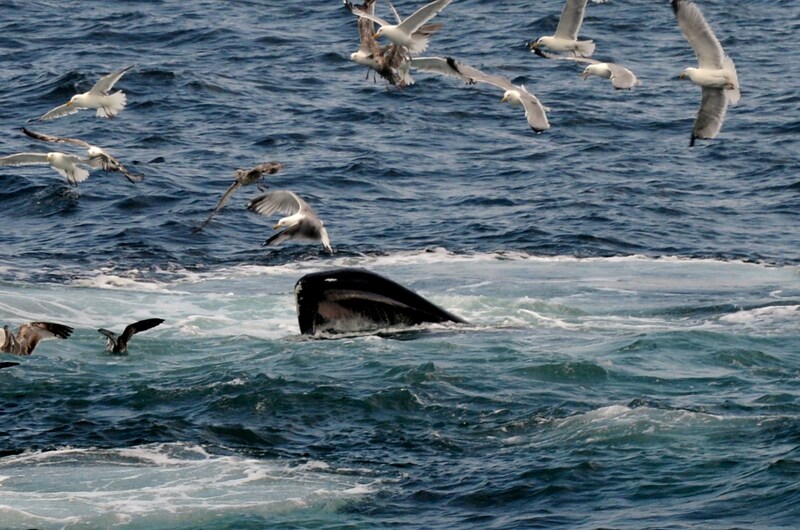 This week we have seen the whales feeding on sand eels. We got a good look at one unlucky sand eel as a bird picked one up and swooped by the side of the boat. In addition to the number of whales, the quality of sightings has been just fantastic. There is nothing like watching whales around us, but when one surprises us and surfaces RIGHT next to us, it is such an exciting feeling. We were lucky enough today to have a couple of bubble nets form on either side, with whales coming up just yards away. Polaris (left) dives deep next to Treasure. A passenger asked me if whales ever come any closer than they already were- soon after three humpbacks created a bubble net and fed just feet away! During our afternoon trip we were also treated to a whale flipper slapping and breaching before watching the feeding frenzy going on about a mile away. 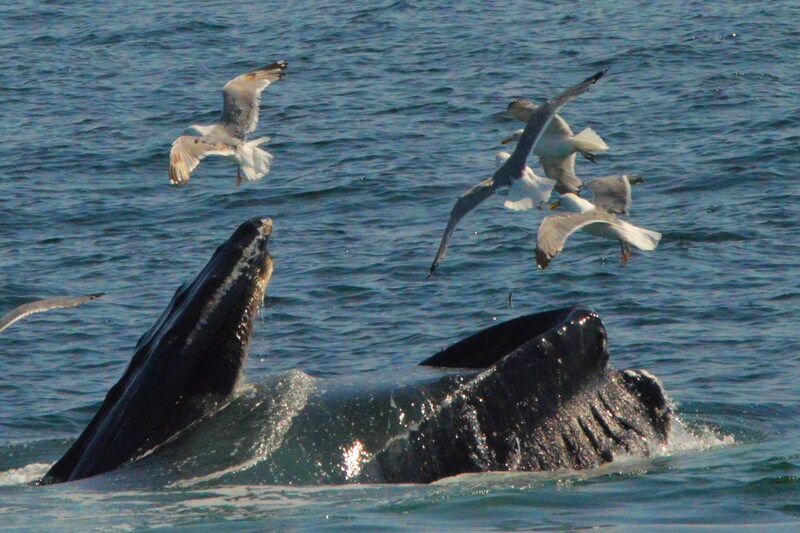 Thank you to CAWW’s good friend, Julian for this photo of a humpback named T-Rex breaching! Both the morning and afternoon trips today were fantastic! We started in the morning wondering if we would have to travel far to find the whales like we have in the past couple of weeks. Spending the day with wild animals, you never really know where they will be or what they will be doing. We happened to stop on one humpback, sooner than what we had expected! We quickly realized there were a number of whales in the area- maybe 10-15 humpbacks, as well as a few minke whales! We were able to spend time with whales we identified as W, Iris, Warrior, and Pele for most of the morning trip, including lots of feeding! 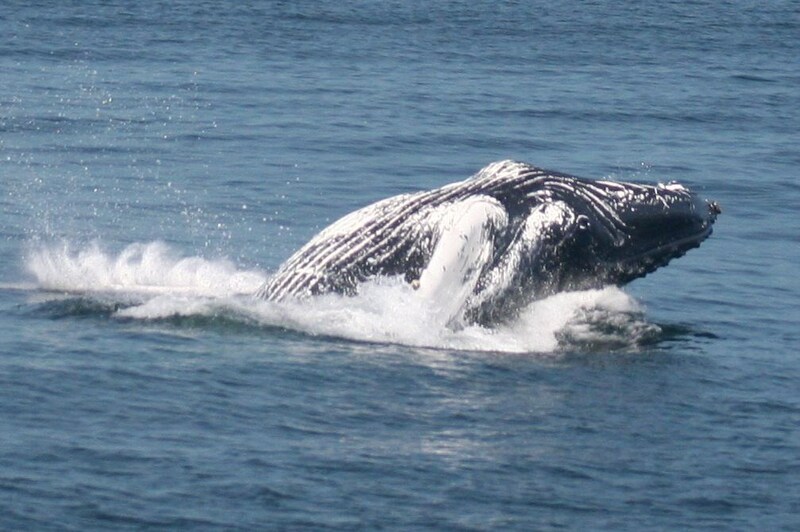 A humpback lunges through a patch of bait fish. The afternoon was just as great. 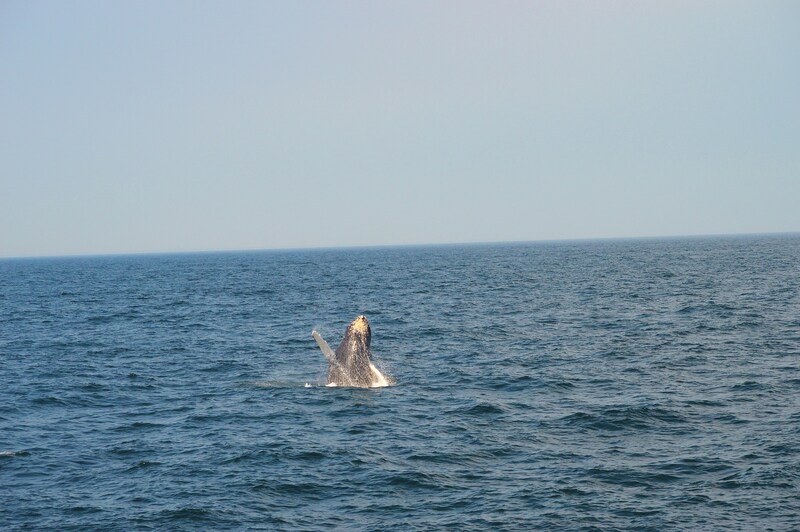 We saw a few of the same whales, and were also able to add Thread to the list, as well as Tornado and her calf. 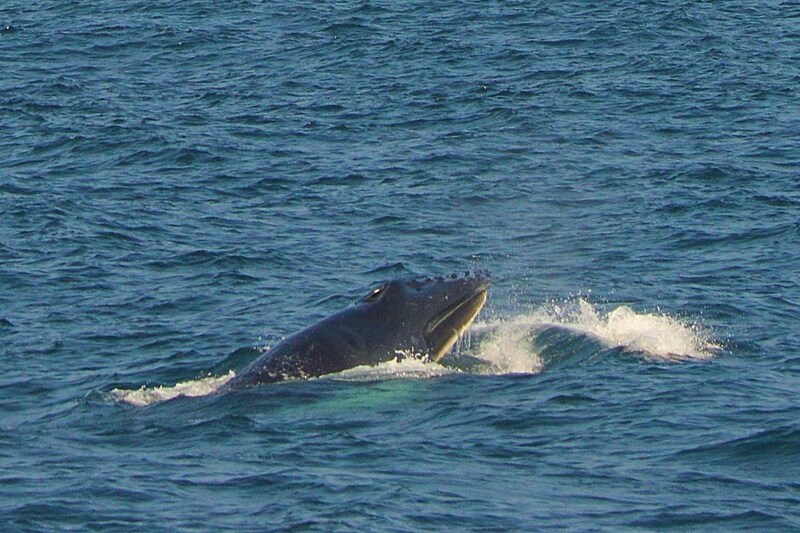 We were having a great time when this little whale breached right next to us, not once, but four times! We noticed mom bubble feeding nearby. 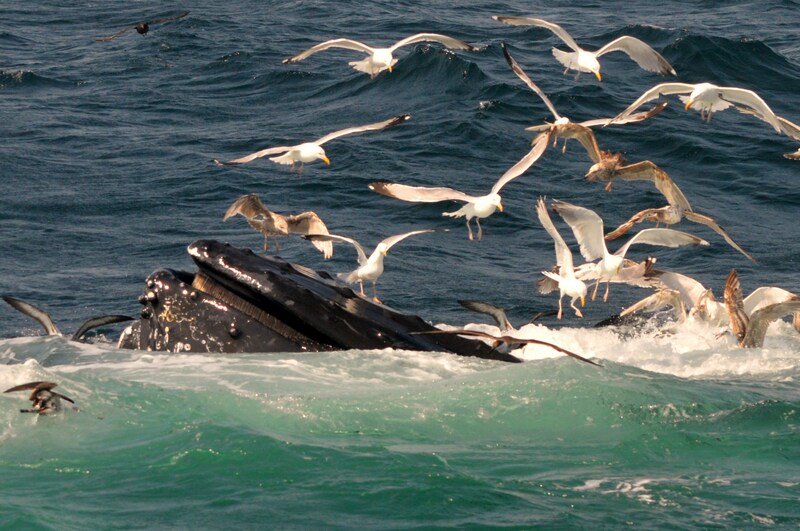 A gull catches a ride on a humpback while others search for a fish to snack on. 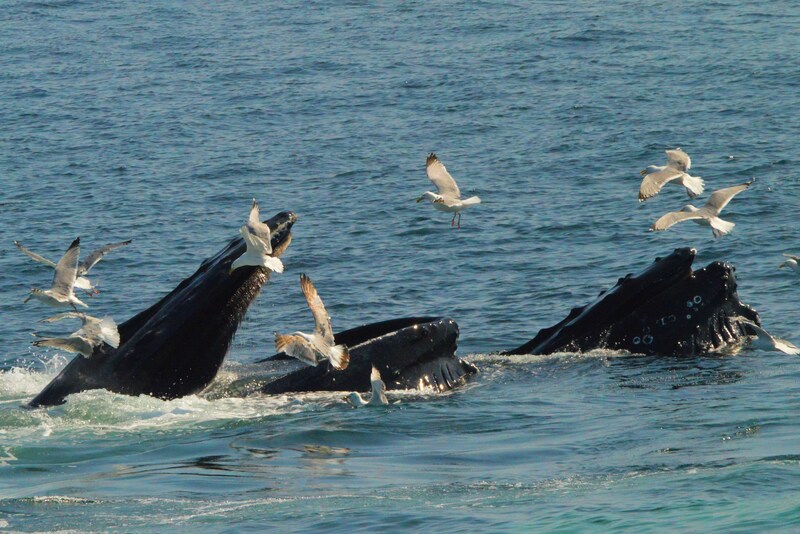 Two humpbacks surface as they feed. 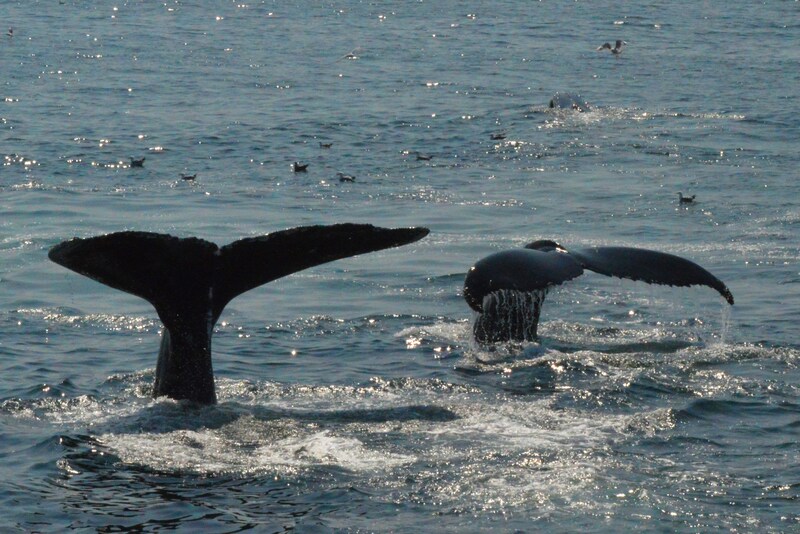 It was just amazing to be watching a couple of whales at one time, and to see so many in the background, near and far. Today’s trips were definitely a treat, and reminded us just how incredible these animals are.